We are very happy to report that new Chuck, or Monster Chuck as he is known by some, has performed amazingly well on his first trek. 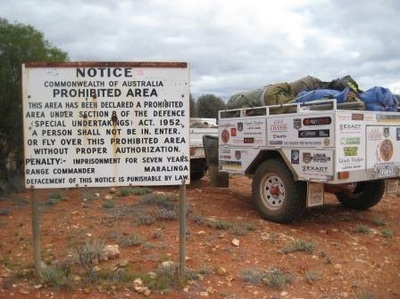 TTT5 went to Coober Pedy, along the Anne Beadell Highway to Voakes Hill Corner, down to Cook, Nullarbor Roadhouse and back to Wangaratta, covering over 4600 kilometres, without a drama or the hint of a problem. A fantastic effort went into putting this machine together, and the results are a credit to the build team of David Brock and Carl Stibilj. 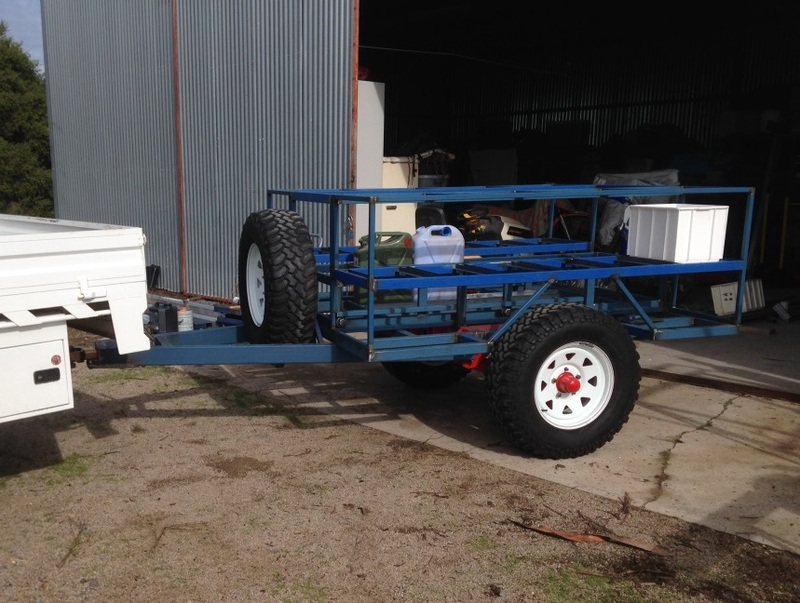 Rolling Chassis! Early June The mechanical genius and his trusty side-kick the Crazy Wog have got New Chuck to rolling stage. The photos below show it connected up to the D-Max. 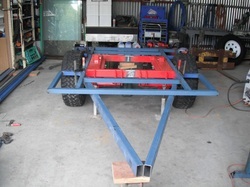 At the end of May the base frame has come together. The G & S Chassis which is a coil spring independent set-up had to be 'cut and shut' to narrow it down a bit. 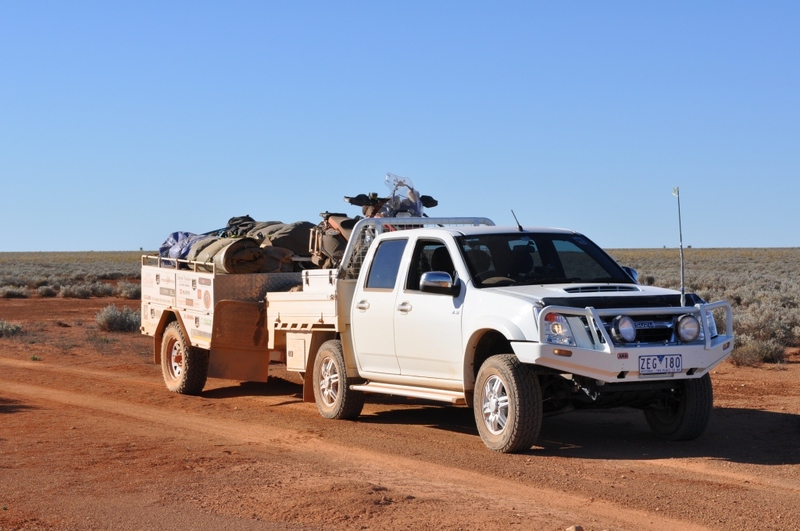 Many of the tracks we trek are narrow and the trailer needs to stay within the width of the vehicles. The centre tray slides in and out to access the jerry cans and water tanks. A total of 12 cans can be stored in this area. Thanks to some fantastic supporters and some hard work, Chuckwagon 2 is rising from the ashes...well the workshop floor at least! G & S Chassis has supported us with a great deal on a suspension system that has been 'cut and shut' by the 'Mechanical Genius' and overlayed with a floor frame and towbar. This is going to be one tough trailer! Check out G & S Chassis's great range of products here. The Chuckwagon is dead...long live the Chuckwagon. 2013 - Chuckwagon left on the side of the Anne Beadell Highway after breaking a leaf spring. After many years of loyal service, the Chuckwagon has had its final run with the Trek The Trak Team. 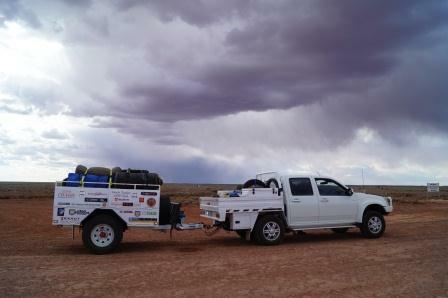 In the end, the harsh realities of the Anne Beadell Highway proved too much for our old mate, and with much sadness we have released the Wagon to lighter duties. In our past three years ol' Chuck has done his best to provide us with challenges and difficulties; from loose bearings to broken spring shackles, dodgy treg hitches and this year a completely broken leaf spring (one that we had previously upgraded!). However, we have a plan to get back on the road! The pdf file at the bottom of the page sets out in detail what we are trying to achieve. A you-beaut fully off road camping trailer just doesn't grow on a tree. 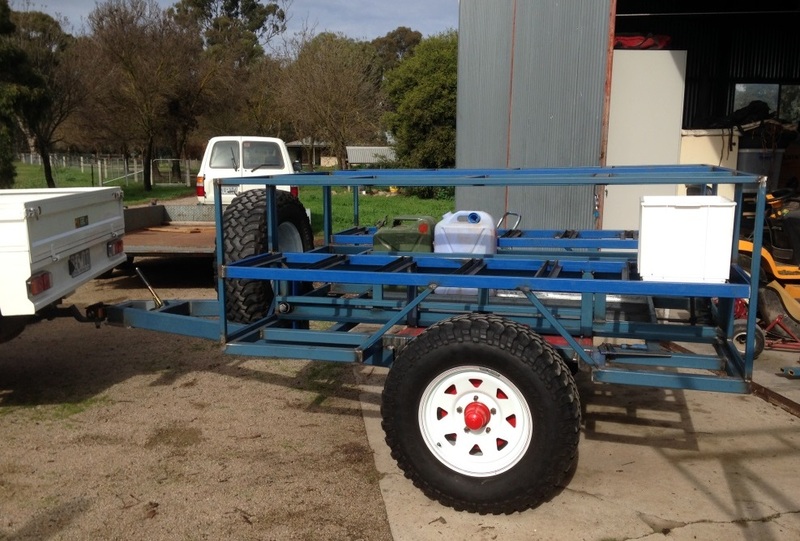 So TTT is embarking on another ambitious project - We will build a new Chuckwagon. Based on our own design and constructed by a team led by our very experienced trailer constructor David Brock, we are now collecting components and looking for funding support for Chuckwagon 2 - The New Chuck. To do this we are looking for support from sponsors and friends and from industry. If you can assist or have contacts or leads in particular in the four wheel drive industry we would appreciate you contacting us. We can offer great support and sponsor benefits, including having components and equipment tested in very rigorous condition. We can be contacted at trekthetrak@gmail.com or on the contact information on the document below.